Summer 2019 edition available August 2019. 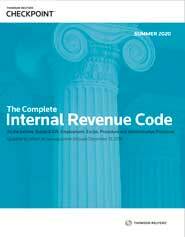 To order the Summer 2018 edition of the Complete Internal Revenue Code please call 1-800-950-1216. The 2019 Summer print and ProView eBook editions will be available in August 2019. You can pre-order your edition today. The entire Federal Tax Code, and its complete history, is at your fingertips with RIA’s Complete Internal Revenue Code. This convenient, easy-to-use volume provides you with the complete legislative history and a comprehensive topic index to speed your tax research. Cautions from our editorial experts provide you with key information about special rules and effective dates needed to properly apply the Code Section. RIA’s Complete Internal Revenue Code includes all legislative changes up to its publication date, providing you with a complete history of all amendments affecting a Code Section.